Kawasaki Versys Forum > Kawasaki Versys-X 300 Forum > Versys-X 300 General Discussion > Small tank bag with window big enuf for Galaxy Note 8? Small tank bag with window big enuf for Galaxy Note 8? I've added my sheepskin and a cheap Emgo tail bag to my brand new VX-300. As you can see from the photo, however, there really isn't much room for a tank bag on this thing. Yet I'd like to have a tank bag handy to at least have my phone and wallet handy while riding, and ideally would like a transparent window so I can see my phone's map application thru the window. I looked at the local Cycle Gear for a tank bag, and didn't see one that fit *and* had a window big enough for the Note 8 (which is a *big* phone). Also, a pair of slim panniers would be nice. Something big enough to haul a couple of bags of groceries home, that's all. The Kawasaki ones are about the right width but are way too expensive for what they are. Anybody else have some opinions here? And finally, those mirrors are *terrible*! They're way too low and too oddly shaped. Anybody have ideas for good mirrors for this beasty? 2018 Versys-X 300 ABS. Former bikes: 1983 Honda FT500 Ascot, 1985 Honda XL-350, 2001 Kawasaki KLR-650, 2003 Kawasaki Concours, 2008 Suzuki V-Strom 650. Last edited by badtux; 04-10-2019 at 04:27 PM. As far as a tank bag I'd recommend the Givi quick release tank bags. 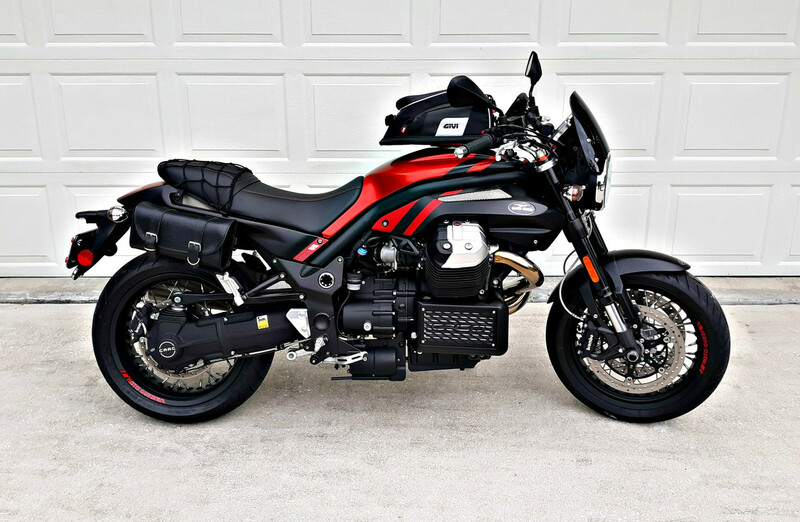 I put a larger 15 liter quick release tank bag (XS-307) and ring on my Moto Guzzi Griso last year, its high quality, rock solid and they hold their shape. No buckles or straps and its quick on and off with the push of the button. Most of their tank bags have the window on the top. I recently ordered the same larger 15 liter bag for my VX300 and mounted the quick release ring to my luggage rack, so I use it as a luggage rack bag. But now I'm thinking about ordering the ST602 as my tank bag for the VX300, the 15 liter is too large for the tank area, the 602 is only a 4 liter bag, it would be nice for personal items and has a cell phone window in the top, but not sure if large enough for a note 8. As far as side luggage, I have no recommendations because I've been trying to avoid adding them to the bike. I did purchase some Rapid Transit bags and I fabricated and mounted some brackets for those rare times that I do need saddlebags. Last edited by zebraranger; 04-10-2019 at 05:30 PM. I got the Bilt v2 tank bag from Cycle Gear and it is perfect. Pretty darn small, good magnets, and has a clear window the full area of its top. I will try to get a picture of it tomorrow. It was like $25 or 30, can't remember. Have not tested it loaded full, but it sits nice and tight even at high speeds. Interesting little tank bag, and the price is certainly right. Is Bilt a Cycle Gear brand? 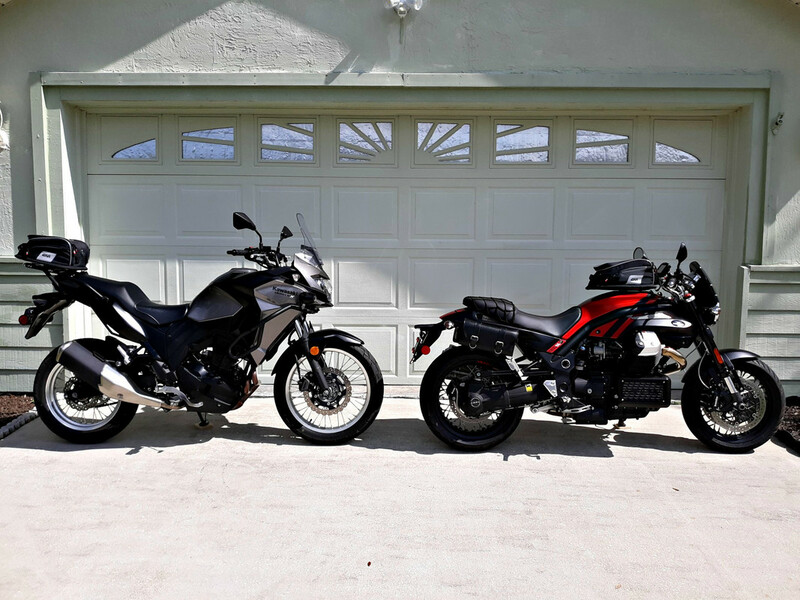 I think I found some mirrors to replace the terrible stock mirrors (which are more about looking cool than being able to see behind you), they're basically identical to the 1st generation Versys mirrors which were a nice useful rectangular shape instead of some weird trapezoid. We'll see, they should arrive by Friday. FWIW, here is my setup for commuting. I attached the toolbox to a piece of plywood and attached that to the back plate. Speaking of side cases, Pelican top loading (model 1430, $99) box can be used - I've seen some KLRs with these attached. Regarding commuting, the best accessory I've added are the LED aux lights on the front fender. They work for my visibility and for oncoming traffic. Last edited by Pekes17; 04-11-2019 at 09:40 AM. Yes, BILT is Cycle Gears in house brand name. I have their jacket also, pretty good stuff for the money. If you local place does not have it, you can order it on line and have it shipped to the local Cycle Gear for free. Pretty sure if you get it there and then say, well, that won't work, they will take it back at the store. Pictures later. I have three Cycle Gear stores within a 20 mile radius of my house, I didn't see this at the one I usually go to, I'll check around and see if the others have it. Or else just ride my bike there just to put some smiles on it . Regarding the tool box for a trunk, the Emgo trunk costs $65 and was a lot less hassle mounting than a toolbox would be. I had to slot two holes in the provided mounting plate and drill two new holes, and done. 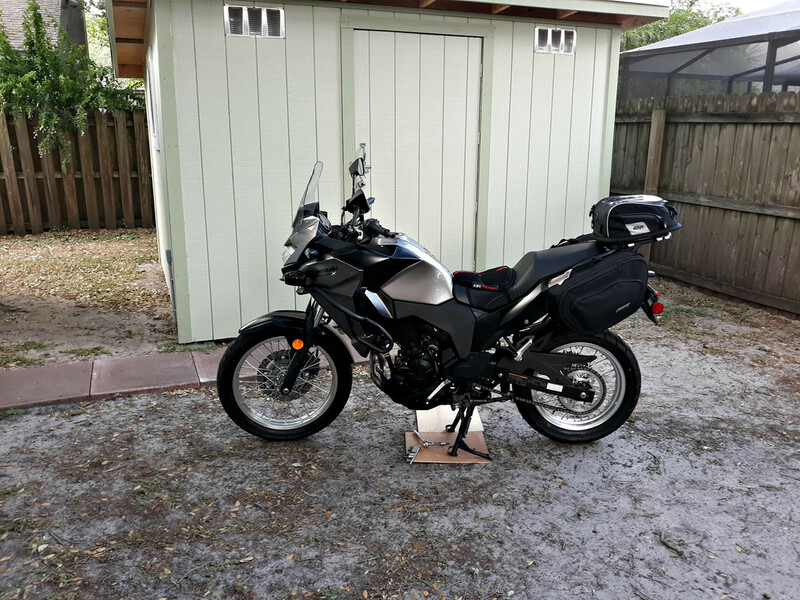 And it removes like a Givi top bag if I need the luggage rack for some other purpose, or just to take it into the house if it's full of groceries. Last edited by badtux; 04-11-2019 at 09:38 AM. You're right, that EMGO trunk looks like a better idea - and inexpensive. Although I can carry 2 bags of groceries plus 2 bottles of wine, the top box stays attached (4 wing nuts). Last edited by Pekes17; 04-11-2019 at 10:38 AM. I'd suggest being very careful of having your wallet (c/w credit-cards) that CLOSE to MAGNETS. I carry my wallet in the chest pocket of whatever jacket I'm wearing, or in the outside chest pocket of my HI-VIS vest. Here are a couple pics of the BILT on my V650 (for size comparison). Eddie is correct about strong magnets, however being old and forgetful (Eddie is just OLD) I never leave anything in there that I could not afford to loose if I inadvertently left it on the bike and it was stolen. I generally remove the magnets and put straps. In my experience magnets always wear a hole in the paint. The "chip" type credit cards aren't harmed by magnets. Too bad that our gas pumps here in the US don't accept the chips yet. ...Too bad that our gas pumps here in the US don't accept the chips yet. I used the "chip" function at gas pumps LOTS of times during the 'winter season' in AZ! The last road trip I took, from Santa Clara CA to Pineville Louisiana, I think there was 2 gas pump card readers that whole trip that accepted a chip. The rest were still magnetic swipe. Including the one at the truck stop in Arizona south of Phoenix near the I-8/I-10 intersection that I filled up at. ...Including the one at the truck stop in Arizona south of Phoenix near the I-8/I-10 intersection that I filled up at. I know the truck stop you're referring to. I've eaten there but don't believe I ever got gas for the bike. I have the Pelican 1430's on my KiLleR, good strong kit. One has a bottle opener mounted on it and is lined with closed cell foam. I drilled a couple of holes on the inward bottom corners for water drainage. Works a treat. Okay, so I looked at the Bilt V2. It's too short to hold a Samsung Galaxy Note 8, which is a *big* phone (and tall), about an inch sticks out of the window. Bummer. I'm beginning to think I need some sort of handlebar mount anyhow. That's a short tank and hard to see the phone if it's on the tank. So maybe I'll get the Bilt V2 just to hold a spare pair of gloves or something. Hmm.